Creating a common reality is a part of the foundation of the Apollo Root Cause Analysis methodology. It is important that language and definitions are consistent among all parties involved. When the Apollo Root Cause Analysis methodology is applied correctly everyone who participates truly understands the value of the problem, what the solutions are and how they will affect the problem. Establishing a universal reality is a bigger challenge than you might think. No one shares the exact same experiences or interprets information in the exact same manner. Good problem solvers know to take these different perspectives into account as they forge a path to the solutions. Just as individuals apply their own unique perspective when conducting specific RCAs, companies apply their unique organizational culture when implementing an RCA process. Establishing company standards by defining an RCA champion with clear expectations and implementation procedures in place will keep your organization on the path to RCA success. Another way to stay at the top of your game is to learn from the experiences of industry peers. Here we take a look at a conversation between Tom, an Engineering Team Lead and RCA champion and Jack, an expert Apollo Root Cause Analysis methodology instructor. You are so right. Many people have preconceived idea that there can only be one root cause. They are driven by this perception to that end. It is quite a limiting concept for those people. They can become quite tunneled in their thinking, offering a close-minded approach to their problems rather than an all-embracing search for knowledge and information that could lead to enlightenment. Some anecdotal information even suggests that this mind frame is taught and it quite difficult to rattle their cages and try to shift their paradigms. How do you define root cause? I define root cause as an opportunity for improvement. A single root cause cannot exist on its’ own, there must also be at least one condition. Here, I cannot come across as too much of a know-it-all or people roll their eyes, so I need a quick snappy go to response that is quick and brief and simple and does not come across as a nerd or a geek. That’s just where I work, as there are no formal RCA people in this division – we all share the work on investigations and most are engineering failure investigations that I do out of my own volition, and share with my team. In your experience, what are the major setbacks you have seen with people applying the RCA process? I’d like to get better and avoid these mistakes. You are doing a great job, persevere. Changing peoples’ perspectives takes time especially if you are the only one flying the flag. A major key to success is making sure you are asking enough questions and following a process that demands these questions be asked. Sometimes people take shortcuts to speed up the process…less to think about…less time…must be better! And they can still argue that they have a solution. For simple problems this may even work and they could achieve a satisfactory result, but for complex problems this approach simply doesn’t come close to being comprehensive enough. The lack of knowledge and training in this area now comes back to bite them and their problems invariably don’t go away. Without a solid RCA foundation and process in place the structures within the company they work for won’t raise any red flags that something may be incorrect or ineffective in any way….so the end product of a subpar RCA (the report) is accepted. If management doesn’t embrace the change then reverting to old acceptable habits is just easier. The key to avoiding these major failures lies in overcoming the resistance to change. Involving your team in the RCA process and sharing your successes with management is a great way to gain support. I got into the habit of now actually doing an initial draft RCA live in front of my team. I draft the RCA in a bound book which I have dedicated to this purpose and follow the cause and effect pathways like the software. I feel like this approach is more relatable with my team and I am able to get their input quickly. We are usually able to identify half a dozen possible causes in just a few minutes. Afterwards I go to the software and expand on it. Then I formalize and save the RCA in the software which checks all my work. Hope you are in Sydney sometime soon, Jack. Your teaching techniques really work and I liked your style. I think in 20 years of taking training your lessons are the ones that have stuck the most with me. If you have questions or ideas to share and would like to connect with people who have been trained in the Apollo Root Cause Analysis methodology with ARMS Reliability join our Apollo Root Cause Analysis methodology discussion group on LinkedIn. According to a definition applicable to the insurance industry, an accident is an event which is not deliberately caused and which is not inevitable. A typical insurance policy has a significant number of exclusions that are the “evitable” circumstances. Logically, any situation which is reasonably evitable and which likely has harmful consequences ought to have been identified. 1. How many injuries have been recorded at your location(s) in the past year? The often cited adage “you can’t manage what you don’t measure” is pertinent here. Data is king; knowing how many injuries have been recorded at all locations for your enterprise will not only enable comparisons between sites and an analysis of the common and different causes, but also can be used to motivate greater improvements at the lesser site(s). 2. Does that number include the near misses? Or aren’t they reported? The expression “near miss” clearly indicates a close call, but all too frequently it occasions relief rather than analysis. This is because people look on the bright side and put the escape down to good luck. Overcoming this complacency is a challenge. The issue for the organization is that all too often these events are simply not reported, or reported too long after the event to enable an accurate re-construction of the event. This compromises the ability to derive any “lessons learned” that could generate appropriate improvements. 3. Would you know if the near misses hadn’t all been captured? The simple fact is that “you don’t know what you don’t know”; this situation calls for a process of acknowledgement, if not reward, so that the incident participants have no fear of punitive measures being applied when they report the circumstances of the near miss. This necessitates the clear communication of a “no blame” philosophy. If employees feel that they will suffer some negative consequence they will be loath to volunteer information about the near-miss incidents. 4. Is your record improving? Unless the data is being promptly collected, accurately recorded, and analyzed, trending will not be possible and improvement not apparent. The objective is to have a demonstrable improvement evidenced by the statistical record. The accuracy of this data will depend not only on the creation of the “no blame” culture but also on the refinement of the methodology and tools employed in the investigation of incidents. 5. Have you set targets for improvement? Establishing fresh targets and goals periodically is the only way to ensure the improvement is continuous. Even a site with an almost blemish-free record needs to be totally vigilant about the changes that are being undertaken there. Change is the only constant and, regretfully, is also an opportunity for hazards and harm to arise. The fresh targets ought to be reflected in the key performance indicators (KPIs) applicable to the respective safety roles for your enterprise. 6. Are there any unidentified hazards facing the personnel? Only systematic inspection and auditing processes will reveal previously unrecognized hazards. The certainty that you have minimized risks and hazards will grow proportionally as the employees who encounter the hazards demonstrate their ownership of the safety program. They have the ultimate control of the likely causes of their own potential harm. But whether the personnel have accepted ownership of the program or not, it is incumbent on the responsible officer to implement the specific hazard identification process. This will necessitate close engagement with the plant or equipment operators, technicians, or any person with an exposure to their work environment. Yes, that’s everybody. There are also hazards of the interpersonal type that may never be apparent to the observer; bullying and stress are increasingly the causes of substantial claims for compensation and can only be detected by building a trusting relationship with the personnel and developing confidentiality protocols. 7. How effectively are you learning the lessons from each “accident”? The parlance “lessons learned” is commonplace but not consistently applied. These are words that express an intention to make improvements in the organization but all too often focus on the actors in the event rather than the systems and processes that are central to the business. “Human error” is the categorical expression most commonly heard when blame is being attached and represents a plethora of mistakes that humans make. Discovering that precise error in this unique event and the reason(s) for it can add value and lead to preventive measures being implemented — but not in isolation, not as the so-called “root” cause. Perfect knowledge, perfect understanding, and perfect operation by all humans in the enterprise are a fantasy. Humans are fallible and accidents will happen if the situation exists. 8. Which causes are “evitable”? The “evitable” causes are simply the known, designed, or planned components of the situation – the hardware, equipment, systems, and processes that are used in the production of the goods or service in question. These are all possible causes which, with a human interface, can create hazards with potential negative safety consequences. They are the opportunities for establishing controls or installing barriers that prevent harm. The safety program needs to identify improvements to the systems or equipment, which would at least minimize the likelihood of a repeat occurrence given the fallibility of the human factor. What are the possible failure modes or the mis-operations that could occur? 9. Can you demonstrate that you have thoroughly and methodically analyzed every event in order to prevent recurrence? A thorough and methodical causal analysis is not possible without the creation of a cause map. This is best achieved through a mediated process involving the pertinent stakeholders and subject matter experts and identifying and arranging the proven causes in a logical manner. It needs to be both comprehensive and comprehensible to win the confidence of the decision makers who are looking for recommendations that will effectively modify, substitute, or eliminate the causes. There are regulatory authorities that have expectations in this sphere and will want to see the assiduous application of a method that has proven to be effective regardless of the industry or problem-type. 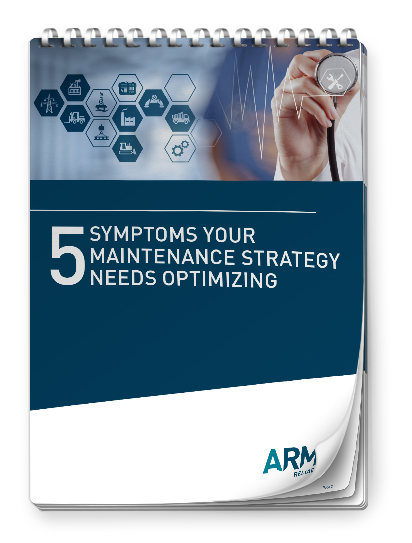 ARMS Reliability is here to help you answer these questions. 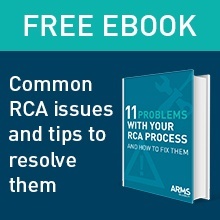 Our free eBook “11 Problems With Your RCA Program And How To Fix Them” is a great first step to figuring out “How can we do better?” Download it here.